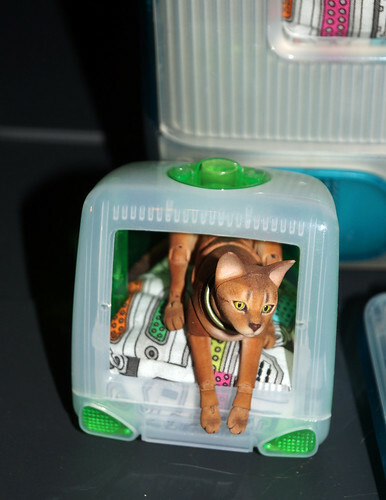 While searching the internet for parts to restore the iMac cat bed to mint condition (sans innards), I discovered the most wonderful thing: a miniature iMac! Well, of course I had to get one. Turns out, it was pretty easy to modify, too. 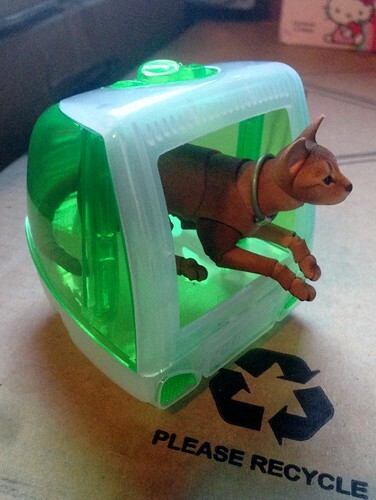 The screen came right out with a minimum of hassle – much easier than the real one! It also just so happens to be the perfect size for the Elleo Jacoby ball jointed doll. I even made a little cushion for it…just like the big one! Previous Aby-a-Day – August 30: Would you like chips with that? Is all this crap going to Sweden? 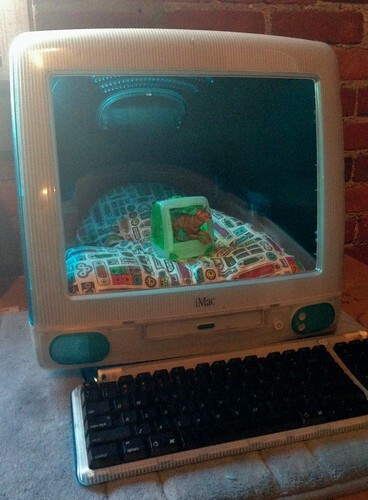 That is amazing that you found that toy iMac! That little iMac is perfectly sized for tiny Jacoby!